After numerous victories against Covenanter forces that saw him briefly take control of Scotland, the Royalist commander James Graham, Marquis of Montrose was surprised by a much larger and battle-hardened force under Sir David Leslie. 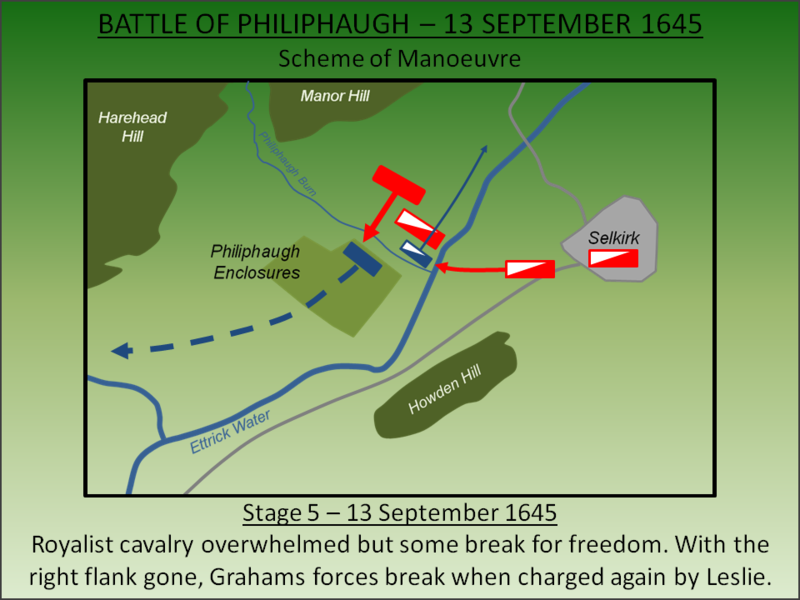 At the Battle of Philiphaugh, Graham’s forces were destroyed ending his military dominance of Scotland. In August 1643, after a sustained diplomatic mission on behalf of Parliament by John Pym, Scotland entered the war against King Charles. The policies of the 1630s, where the King had attempted to reform the Scottish church away from Presbyterian lines ultimately causing the Bishops War in 1639/1640, had not been forgotten. Now these policies came to haunt the King as Scottish forces invaded England in January 1644 under the command of Alexander Leslie, Earl of Leven and had achieved devastating effect at the Battle of Marston Moor (1644). By Summer 1645 the Royalist war effort in England had all but collapsed following their defeat at the Battle of Naseby. In Scotland the situation was different. Royalist forces there were under the command of James Graham, Marquis of Montrose. Although he fought against the King as a Covenanter commander during the Bishops War, he had opposed the subsequent power of the Presbyterian leadership under Archibald Campbell, Marquess of Argyll. When the war in Scotland resumed in January 1644, King Charles appointed Graham his Captain General in Scotland. His effective mobilisation of the Highland forces, many of whom were opposed to Campbell, saw him win a number of significant victories. At the Battle of Tippermuir (1 September 1644) he had captured arms for his small force facilitating his assault on Aberdeen later the same month. In February 1645 he defeated and humiliated Campbell at the Second Battle of Inverlochy with a stunning advance over Ben Nevis. He defeated further Covenanter forces at the Battles of Auldearn (May 1645) and Alford (July 1645) but his crowning achievement was the Battle of Kilsyth, fought on 15 August 1645, where he briefly became master of Scotland and summoned a Parliament in Glasgow. Graham's forces were comprised of a mix of Highlanders and Irish soldiers. Following Kilsyth, coupled with his refusal to allow his men to plunder Glasgow, many left his army and returned home. Others became disaffected when Ludovic Lindsay, Earl of Crawford - a former enemy - was appointed as commander of the Royalist cavalry. By the end of August 1645 his army had been reduced to around 500 infantry and 100 cavalry. Graham now marched into the Scottish Borders hoping to recruit new soldiers. But, unknown to him, Major General Sir David Leslie (Alexander Leslie’s deputy) had been ordered to return from England to engage him. Sir David Leslie, Lieutenant General of Horse raced north with a large cavalry force augmented by a smaller infantry detachment. He crossed the border on the 6 September and headed north expecting Graham to return to the Highlands. However, having learnt of the Marquis' position in the Borders, he rendezvoused with additional forces and then turned south to intercept. He approached Selkirk late in the evening on 12 September. Graham's recruitment campaign in the Scottish Borders had not gone. Whilst William Douglas, Marquis of Douglas had joined his cause (bringing a sizeable cavalry detachment with him), very few others joined his banner. He marched from Kelso to Jedburgh and on the evening of 12 September camping his army at Philiphaugh just to the west of Selkirk. His intelligence was woefully inadequate for he had no knowledge of Leslie's proximity. Due to surviving pay records the Covenanter forces can be cited with some accuracy. They were divided into ix Regimens of Cavalry and four of infantry. Significantly these forces were battle hardened having spent the last 18 months engaged in operations in England including participation in the Battle of Marston Moor. 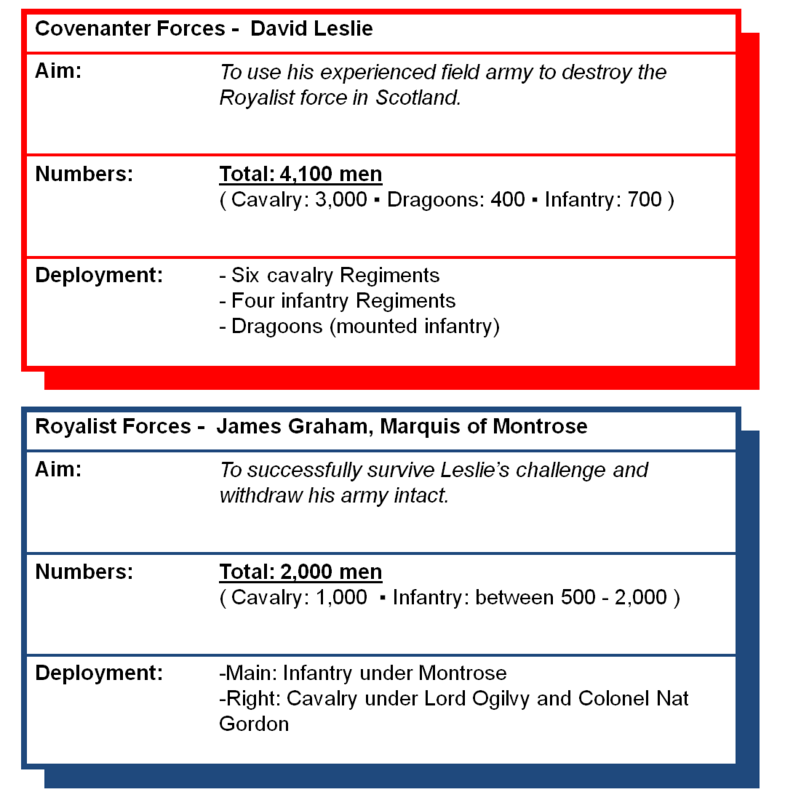 Figures for the Royalist army are disputed but, even taking the highest estimates, they were significantly outnumbered by the Covenanters. The battle was fought on the northern shores of the Ettrick Water in and around Philiphaugh; terrain defined by a series of enclosed fields and hedges. Leslie launched a night assault on the Royalist Rearguard who were camped around 2 miles from Selkirk at a small hamlet called Sunderland. When their confused reports were made to Graham, who was billeted in Selkirk itself, the suggestion there could be a large Covenanter army in the vicinity was dismissed. No further action was taken by either army until dawn with Leslie camping his army at Linglie just to the north of Selkirk on the other side of the Ettrick Water. 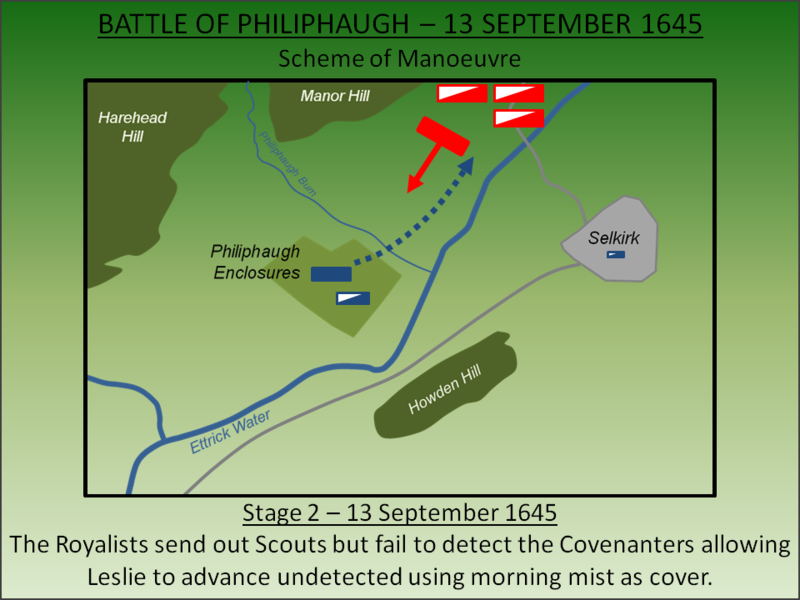 Following the skirmishing of the previous night, the following morning (13 September) the Royalists deployed scouts. Incredibly they failed to find any trace of the Covenanters but Leslie's forces were there and deploying to attack. Using the morning mist as cover, they advanced to within half a mile of the Royalist positions before they were detected. Leslie's forces launched a direct frontal assault on the Royalist line. With most of the Officers still in their quarters in Selkirk, many of the Royalist Regiments were initially leaderless. However, although they had not been expecting a battle, they were in a strong defensive position behind thick enclosed hedgerows with their left flank protected by an irrigation ditch and the right by the Ettrick Water. They twice repulsed Leslie’s forces. Leslie now detached a significant portion of his cavalry, perhaps as many as 2,000, to cross the Ettrick Water and attack Selkirk eliminating any Royalist presence there. Meanwhile the Royalist cavalry, under Lord Ogilvy and Nat Gordon, whilst successfully repealing the Covenanter attacks, find themselves stranded on the wrong side of the Philiphaugh Burn. After having ravished Selkirk, the Covenanter cavalry skirted around the north of Howden Hill and crossed Ettrick Water once again falling upon the rear of the Royalist cavalry. A small portion escaped, including Lord Ogilvy and Nat Gordon, who manage to break through the Covenanter lines. However the majority, under attack from all sides, broke. The remaining Royalist infantry had little choice but to fight on. Their static position on the haugh was defendable whereas if they retreated they would have been cut down by the Covenanter cavalry. However, after around an hour of fighting and on the promise of quarter, they surrendered. The portion of Graham's cavalry which escaped the battlefield rendezvoused with him at Peebles but for the infantry it had been a rout. Many surrendered, having initially been offered quarter, but hundreds were subsequently marched to nearby Newark Castle and executed allegedly at the behest of Leslie's Presbyterian Ministers. He would conduct a similar atrocity in 1647 at Dunaverty Castle. Graham spent the next year trying to organise a new Highland force but, with Charles I now a prisoner and having ordered him to surrender, he went into exile in Norway. He returned in June 1649 in support of Charles II but was defeated at the Battle of Carbisdale and was thereafter hung, drawn and quartered to the delight of his rival Archibald Campbell. His remains were displayed until the Reformation at which point Charles II had his mutilated body interred in St Giles' Cathedral and Campbell executed. Lancaster, J.H.D (2015). 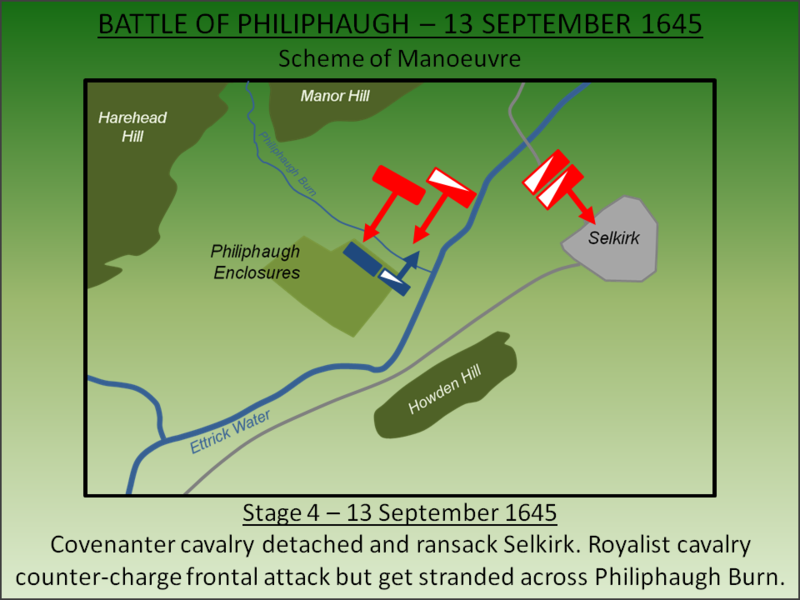 Philiphaugh and Selkirk: Battlefield visit notes and observations. CastlesFortsBattles.co.uk. Ordnance Survey, 2015. Borders. 1:1250. Southampton. An information panel has been erected in a car park overlooking the main part of the battlefield. A large cairn has also been built which is found on an unnamed road off the A708 sign-posted as Philiphaugh Estate Gardens. Use the lat/long below to take you to the monument. Newark Castle, where many of the Royalist prisoners were executed, is also worth a visit. Memorial Cairn. Positioned on an unnamed road of the A708. Take the turning off the main road sign-posted for the Philiphaugh Estate Gardens but then go straight on, avoiding the turnings to your right. The cairn is found in the trees to your left before you reach the houses. Newark Castle. 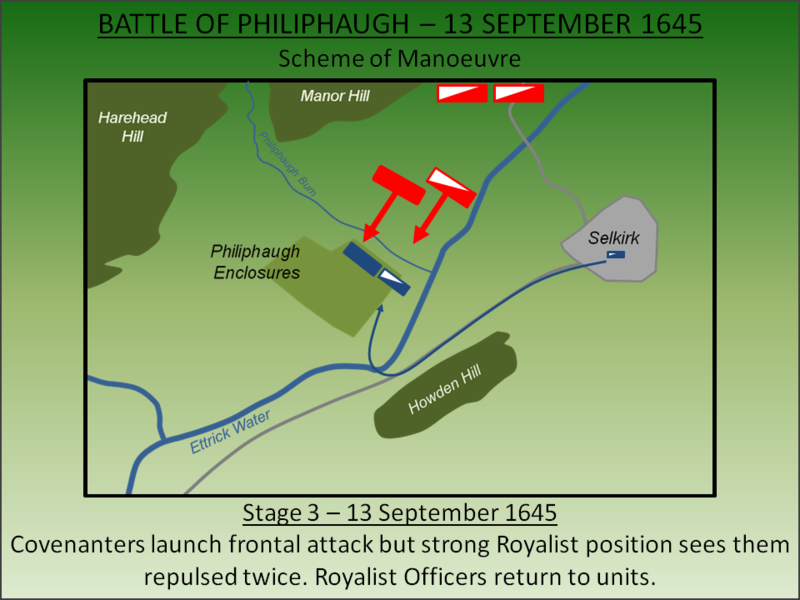 Once the Royalist cavalry had been broken, the infantry fought on knowing their strong defensive position in the hedges of Philphaugh was their best hope at survival. They eventually surrendered, on promise of quarter, but David Leslie was persuaded to set an example by his Covenanter ministers. The majority of the prisoners were marched to Newark Castle and shot - the bullet holes are still visible in the barmkin. The adjacent field became known as Slain Mens Lea. Information Panel. Near the Salmon Viewing centre is a small hut with information panels on the battle. This site was near the centre of the fighting in 1645. Ettrick Water. The Etrrick Water seperated the battlefield from Selkirk. The battlefield is today straddled by the A708. The information panel can be found in the car park sign-posted as ‘Salmon Viewing Centre’. The monument is not sign-posted and hidden in trees.